Here’s the story and the pictures I mentioned the other day. The pictures were taken with a disposable camera, and aren’t very good alas. In 1956 the New Yorker published “Mr. Hunter’s Grave,” one of writer Joseph Mitchell’s best known articles. It told the story of George H. Hunter and the abandoned cemetery on Staten Island where he wanted to be buried. Mitchell met Hunter on one of his trips exploring wildflowers in Sandy Ground, a largely abandoned town founded by free blacks before the civil war. Mitchell’s mother Virginia, a former slave, came there with her son after escaping to Ossining via the Underground Railroad. Hunter lived on Bloomingdale Road, across the street from the African Methodist Episcopal Zion church (he was on the board of trustees). Mitchell had written that he could walk the whole day on that road without seeing a single soul because the children and grandchildren of the original oysterman had long since moved away. Hunter took Mitchell to the church cemetery where the widest variety of wildflowers could be found. Established in the early 1880’s on a dead end dirt lane called Crabtree Avenue, it hadn’t been tended for years. Gravestones covered with flowers with names like beggars lice and partridge pea were almost impossible to read. Some were marked with wooden crosses. 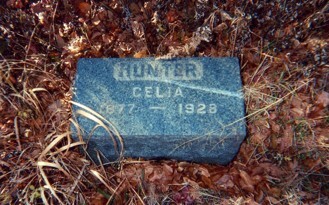 Then Hunter pointed out the grave of his first wife, Celia Ann Finney. To her left was the grave of his second wife Edith. 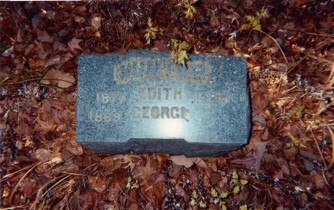 George’s name was listed underneath Edith’s, along with the date of his birth, 1869. This was where George Hunter wanted to be buried, with his second wife Edith. The piece ends with Hunter learning that Edith was not buried deep enough, and that chances were he would not be buried with her, but in an empty plot to her left. 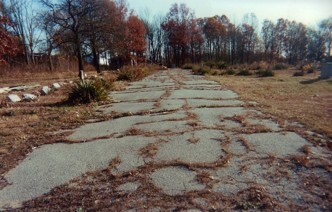 I went to Staten Island in 2001 to look for the cemetery and to find out where Mr. Hunter was finally buried. I took the exact same Tottenville bus Mitchell would have taken to get there. At the time I wrote: the cemetery is well tended now. Vandalized in 1997, it has since been declared a New York City landmark and restored. Too restored. It’s bare and cold and missing a sense of renewal it might have had when it was lush, fragrant and overgrown. The wooden crosses are gone, as are most of the trees, shrubs, and wildflowers. But Mr. Hunter’s grave is unchanged. It’s exactly as Mitchell described it, except now there’s a gravestone for Hunter’s only child William, who died in 1955. He lies at the foot of his mother, Celia. Everyone thought William drank himself to death, I later learned, but when they got him to the hospital they discovered he had cancer. There was no date of death for Mr. Hunter on any of the graves so there was no way of knowing which grave he was in. I went looking for his church and met Lois Mosley, a former tenant of Mr. Hunter’s who had just turned 75 the day before, and she was able to tell me that Hunter had died on April 6th, 1967, at 97, having never left Sandy Ground. Sadly, he wasn’t buried with Edith as he had wanted to be, and he wasn’t buried next to her, as he thought he would be. He was buried in his first wife’s Celia’s grave. I hoped he was okay with that. Crabtree Avenue is paved now. Along the former empty lane were the then new “Sandy Ground Estates.” At the time of my visit, all the houses were $315,000 except the one directly across from the graveyard which was $310,000. The realtor who was there that day had never heard of Joseph Mitchell or George H. Hunter. She didn’t know that to some people, this was the prime location. I’ll bet those houses are a lot more now. Or maybe not. Unlike every other inch of real estate around Manhattan, I don’t get much of a buzz about Staten Island. I thought it was beautiful there though. I wouldn’t mind living there at all. 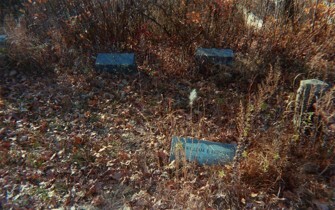 The three Hunter family graves. Where Mr. Hunter wanted to be buried. Where he was actually buried. 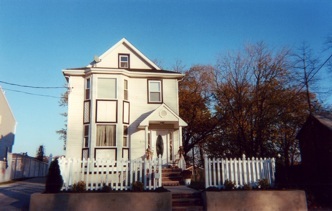 This is a picture of Mr. Hunter’s house. I have another picture of much sadder looking house, except I can’t remember why I took that picture. I have a vague recollection that it was once Mr. Hunter’s house and this was the house he lived in at his death. Another grave at Sandy Ground, a WWII veteran. Thank you so much for sharing this. It is a perfect pre-Halloween story. I ordered Up in the Old Hotel and I’m really excited as Joseph Mitchell is a writer that I am not familiar with, but should be. Happy Halloween from San Francisco! I love that book. I only like the non-fiction though, not his short stories, and of the non-fiction, Up in the Old Hotel and Mr. Hunter’s Graves are my favorites! 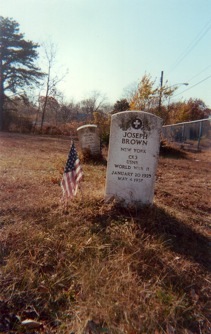 I googled the cemetery after reading the Joseph Mitchell story. Thank you for the photos and information! You’re welcome! I want to go back there again. I’ve just re-read “Mr. Hunter’s Grave” in the re-issue of “Up In The Old Hotel.” While working at Great Kills Beach as a lifeguard (1957-1960) I took a drive along the South Shore and happened upon the vestige of a community called Sandy Ground which clearly had seen better times. Something made me view it as a black community, perhaps I saw a person or two, but it clearly seemed out of character for the built-up neighborhoods along Victory Blvd, where I lived in Castleton Corners, or Forest Avenue, or Stapleton, Tompkinsville, Grymes Hill, or around Curtis HS and Sailors Snug Harbor and Port Richmond. I was delighted to read Mitchell’s references to the Island and oystering, clamming, etc. On rainy days at the beach, we city lifeguards launched the whaleboat and rowed east to the neighboring Oakwood Beach shoals, anchored, and dove for clams. When we had the bilge filled w/ clams from cherry-stone to 3-4 inchers, we rowed back, went to someone’s home and, along with a case of beer, spent the afternoon shucking clams, saving the juice, eating the cherrystones raw, peeling potatoes, and making a giant clam chowder. It takes a lot of beer to make a chowder. Then we’d have a party, another one on top of the cooking party. So I enjoyed reading about the old days of clamming. Once I had a friend over and served up a platter of cherrystone clams w/ a spicy red sauce. Delicious; later we caught hell; his old man was a big-shot in the NYC Health Department which had condemned the beds off the Island for decades to prevent typhoid fever, a fact referred to by Mitchell in “Mr. Hunter’s Grave” and “At the Bottom of the Harbor” and such. I never heard of Mitchell while growing up on S.I. Later, in San Francisco, when I nostalgically purchased “Hotel” I was surprised that he wrote so much about a home town that I didn’t appreciate fully until I’d been long gone. Now I admire Mitchell’s voluminous but spare, if you can dig that, writing style which tells just enough to put you as invisible witness to the person, place, scene and context of what he just described. Well, that was beautifully expressed. Very evocative. I grew up on Long Island and I remember clams being everywhere when I was little, but then clams were no longer a thing. Maybe they were also condemned of LI? That is so amazing explored Sandy Ground in the late 1950’s. I wish you had photographs.